Well we know that’s on the OECD’s To Do list. With the US and CAP also having a Larry Summers-led Inclusive Prosperity Commission and the UN announcing Dignity for All by 2030, income and wealth distribution are supposedly on the current global Must Change through PolicyMaking and Think Tanks To Do List. What’s the other pincer per Szreter and out Third Way Fabians in 2001? This is a long quote, but very useful as a long term explanation of why education always comes up as a tool and where it fits in with the broader collectivist scheme (as usual, my bolding). Now that common communicative competence to be required would also be what guides perception, interprets experience, and motivates future behavior and it is to be common and predictable. Very useful for that social and individual steering capacity governments at all levels are now seeking. A useful paper on all this came out of Europe in 2009 and it’s called “Thinking as the control of imagination: a conceptual framework for goal-directed systems.” That’s us, remember? And the common communicative competence means comparable goals that are invisibly manipulated via educational ‘standards,’ desired competencies that are targeted for ‘testing,’ and other statutory or regulatory mandates. Before I offer up the following quote that is pertinent to all the reimagining of the future and the offering of guiding fictions from the last two posts, it leaves out what phonetically fluent readers have always been able to do. Get a handle on the nature of the world and people historically and consistently through massive amounts of diverse reading. Common communicative competence rules that obstacle to mental reengineering out. The researchers in that article stated that “behavior consists in the control of perceptions.” Yet, we know the whole purpose of using standards to prescribe the categories and concepts all are now to learn as the Framework of a Discipline is to control perception. Now let’s move forward to the quote of what is desired in our ‘goal-seeking system’ as the students and eventually us are being called. Now let’s leave aside the enormous potential of digital learning and the simulations of virtual reality assessments to reconfigure what a mind will soon be internalizing as imaginable. Let’s just get back to all the role-playing assignments that now form such a tremendous part of history and social studies classes. The ubiquity making more sense now? Now let’s go back to David J Staley’s History and Future book to see how common communicative competence in the name of Equity and controlling the Imagination come together. Now with that last quote, I think I will stop and let everyone contemplate the implications of education allowing political power to now create those mental filters for whatever transformational purposes politicians or their cronies find expedient. All going on without telling the students, their parents, or the taxpayers accurately what is being targeted and why. Mental time travel using these parameters is likely to leave us all Lost in Space, except the space is not Outer anymore. Generalized Ears have nothing whatsoever to do with Dumbo and they will not allow us to fly. In fact, I would argue that the phrase ‘generalized ears’, like the hyped Competency or K-12 education built around Equity and Essential Skills for All, is designed to make sure NONE of us is likely to go off the provided script for our future predictable behavior. Maybe instead of the ‘script’ metaphor we should use ‘prescribed path’ since the current K-12 rhetoric is all about Career Pathways and Multiple Pathways to a Degree. Before we get to the whats and whys again, I want to give everyone reading this hope despite these dark designs. Even though Pols refuse to listen as enabling legislation at every level comes up for a vote, as has happened this past week in Congress on the ESEA Rewrites. I would add politicians at every level to that struggle given what we are now seeing. To the progressive polyphonic federalism and Metropolitanism this blog has already laid out, this week came http://www.spatialcomplexity.info/files/2015/07/Making-Sense-of-the-New-Science-of-Cities-FINAL-2015.7.7.pdf . Won’t that go nicely with the above database and required federal education policy that is all about social and emotional learning, internalizing desired Generalized Ears, and then monitoring to check on action in the real world (Mastery)? http://gettingsmart.com/2015/07/personalization-new-frame/ shows how dramatic the confessions are now that there will be desired federal legislation. So what are Generalized Ears? It’s the idea that what a person is likely to perceive from a given experience or provided information “depends upon anticipatory sets.” What has already been cultivated in a student’s, or anyone’s, mind and personality. In cybernetic schooling those anticipatory sets or Lenses are carefully manipulated, monitored, and rearranged when needed for desired political purposes. See Karl Mannheim again above. The same Kenneth Boulding I discussed in my book and we met here http://www.invisibleserfscollar.com/reimaging-the-nature-of-the-world-in-the-minds-of-students-alters-future-behavior-and-social-events/ is the one who said that “one of the main objectives of General Systems Theory is to develop these generalized ears.” Boulding wanted a theory that would reliably predict “the dynamics of action and interaction” and Axemaker Minds get in the way. To quote Ervin Laszlo again on how to shift away from Individualism to Collectivism, planners and politicians must NOT leave the “individual free to think of general reality as he pleases.” He further noted, echoing Mannheim and predicting what we now are calling Understanding By Design or Core Disciplinary Ideas or Cross-Cutting Themes, in 1963 that “unlike previous ages, plain force is [not] the most effective means of winning people today; ideas prove to be the most efficient tools for that end.” Is the bias in the new AP US History conceptual framework making more sense now? It’s not about facts, but criteria to guide what is noticed and ignored. This brain-based instruction article even admits to using a “perception-action” emphasis in the classroom to physically rewire the brain. http://www.districtadministration.com/article/neuroscience-builds-students-brain-power The motto this week after ECAA passage in the Senate seems to be Go Ahead and Admit It Now, no one can stop us. Back to Boulding because his view of Knowledge is everywhere in the Common Core and any subsequent state learning standards that will fit the ESEA Rewrite’s mandates. “Knowledge is not something that exists and grows in the abstract. It is a function of human organisms and social organization…Knowledge however grows by the receipt of meaningful information–that is, by the intake of messages by a knower which are capable of reorganizing his knowledge.” That would be what the ESEA Rewrite and Tom VanderArk above called personalized learning and what gets hyped also as a Growth Mindset. It is why Ervin Laszlo in Essential Society knew a social philosophy stressing the fulfillment of individual needs was necessary to push a more collectivist orientation and that “ideas act on individual minds.” His italics–remember that italization for emphasis every time you hear ‘student-centered learning’ being hyped. What’s wrong with the use of the words Success or Achieve in the ESEA Rewrite or in the Parent Checklist the federal DoED issued Friday, July 17, which talked about ‘development’ and Success in Life as the purpose of K-12? They all reek of the behavioral scientist and system science social engineering goal with its “strongly felt need to get inside the ‘black box'” of the human mind of young people. They treat students as “homeostatic biological organisms with purposive, adaptive psychological properties.” Now when the school or teacher manipulates those properties, they get acclaimed as ‘effective’ and Growth, Achievement, Learning, or Success are all proclaimed. The actual result of psychological manipulation for collectivist, fundamental transformation purposes is obscured. Axemaker Minds, clear and rational, well-stocked with their own personally selected store of facts, specialist minds instead of Generalized Ears, are notorious at not taking the Narrative as provided or the Sound Bytes on offer. If an individual’s perception of reality must be controlled so must curriculum and the concepts to be used to make “intuited experience” comprehensible. If all this seems still too far away in time or too abstract in principle, let’s once again bring this down to the classroom in the here and now. This week an article called “Geocaching is Catching Students’ Attention in the Classroom” was being hyped to illustrate the new need for “active learning as when students engage in developing projects in a more meaningful way than when concepts were simply presented using traditional methods by teachers.” The old way stressed the mental and the rational instead of activity and may not have involved emotionally charged content, triggering that all-important subjective mode of comprehension. Building on the discussions of constructivism in reading and math and science in Chapters 2 and 3 of my book, we learn that engaging instruction and teacher professional development focus now on “ways that constructivist learning environments can help create active, reflective, student-centered learning that is socially relevant and personally meaningful to learners.” Triggering Laszlo’s sought subjective mode of comprehension that cannot see reality clearly and now to be mandated by Congress AND the states AND the school districts AND the accreditors AND generally in a charter school’s agreement for renewal that nobody but me seems to bother to read. I will close with the best example of the now to be required Higher Order Thinking Skills and Understanding once again from Laszlo. Keep in mind its acknowledged purpose too. And after years of practicing this, the student will now be declared to be College and Career Ready. Because with these aims of collectivism and social engineering, the planners know that euphemisms and odd, little known, real definitions, are their friends. In the same way I could look at the vision laid out in the 1991 Learning Society paper from the last post and see the fundamental corners of what Marx and his followers called the Human Development Society, even before the writers mentioned that term without Uncle Karl’s name attached, this week there has been a series of connected reports taking us in the US and globally in the same direction. Education reform and the aims of social, economic, and political transformations always attached to it through the decades, turn out to be an awful lot like learning another language. Once we can speak it, no one needs to translate for us when we are looking at models or aims that seek to get to the same place. Different words or phrases for the same fundamental ideas simply get added to our glossary of understanding. How many times have we heard that the schools must change in this or that manner because the ‘experts’ say so or in order to make our country ‘internationally competitive’. Going back to the 1991 paper, policymakers needed to address and redo the “evolving relationship between individual and collective needs” in order for us to be that Learning Society. In turn becoming a Learning Society was sold as necessary “in order to attain (or retain) their ability to participate successfully in the global economy.” That’s lots of fundamental shifting towards collectivism coming in and being sold surreptitiously as necessary steps to be competitive in a global economy. At least if the commands from the policymakers were to strip naked and parade in the public square as a group or stand on our head on the baseball field when our number is called, we could better notice where this is going and the utter loss of individual control. I hate to frame that desired mindset as being as spineless as a jellyfish and as flexible as an Olympic gymnast, but basically those are good metaphors for the kind of attitudes, values, and dispositions amenable to all these planned ‘progressive’ transformations. No need to inflame the public by mentioning Uncle Karl, the Deweyans call themselves progressive in their intentions and so does the Frameworks Institute. Repeatedly. Same for this recent global call to arms on making sharing and meeting human needs the new basis for the global economy. http://www.sharing.org/sites/default/files/images/Common_Cause_WEB.pdf Must be focus groups somewhere saying ‘progressive’ is almost as cool as having a sleek sports car. Professor Bruner, we did not invent the concepts of force in physics or bond in chemistry. We simply came up with an agreed upon term in English to describe an observed phenomenon. That phenomenon, and its cause and effect relationships, existed before we knew about them and regardless of what we named it. There is something objective going on that is not in fact ‘socially constructed’. It is a bit Lysenkoesque (see Chapter 3 of my book) and consistent with a desire for ideological thinking to pretend otherwise. Aptly illustrated and adequately explained all these terms do aid in comprehension, but where Professor Bruner wanted to go, and where the Frameworks Institute does go, is a push into using metaphors to enable false perceptions, incorrect interpretations, and inapt analogies. All without a body of facts to correct what is wrong with what is being provided. “Reframing Education Using a Core Story Approach” with its tremendous support from cited well-known charitable foundations is worthy of Pravda in its declared intent to manipulate adult “internalized narratives” to create support for the type of education reforms that fit Dewey’s template or those laid out in the Learning Society report. “The goal is to produce a powerful story of education with built-in strategic subplots that can reorient and restructure how Americans think” certainly meets my personal definition of an explicit confession. Who gets to determine what Americans are to think beyond the personnel of all those foundations that pay no taxes while they advocate for collectivism for the rest of us? The report says it is “progressive educators and experts.” Like those educated by Professor Bruner or those seeking the next public or foundation grant, promotion, or consulting contract, and shilling as needed? Now I have mentioned the omission of cites to Uncle Karl in these particular reports even though the Learning Society report does admit to using the concepts of sociology, anthropology, and work with primates as metaphors for what it seeks to experiment with. Theory in Practice and let’s see what happens. My point is that the social science concepts there and the repeated mentions of deferring to experts in these other reports bring in all the tenets of these notorious collectivist political theories and the psychological and cultural research that was carried on in the Soviet Union into our children’s classrooms.Without openly admitting that crucial fact. Prevailing cultural models and patterns really are explicitly laid out as the “challenges that the prescriptive reframing research must address.” At least when you put on glasses or put in contacts, you know they are there and how and why your vision is being prescriptively reframed. That kind of open reframing is not what is being ‘prescribed.’ Hence my hauling out the terms stealth, surreptitious, and, honestly, outright deceit, as so many connected insiders (just read the list of who support the Frameworks Institute) seek to alter how “most American make sense of new information.” They could use the motto that Reframing is not just for students or the new AP History courses anymore. It’s apparently been deemed to be a matter of 21st Century citizenship. I want to close with a couple of the ideological doozies sold as Gaps in Understanding that are non-compliant with what experts know. “Experts understand disparities [among individuals] as a collective concern–because equal opportunity is a moral imperative.” That’s not a matter of ‘knowledge’. It’s a matter of political preference pretending to be knowledge and ignoring the realities that created those disparities. Likewise, “for experts, learning is a process of interaction” is a euphemistic way to describe education under Uncle Karl’s political and social theories and the cultural models they have inspired. Being accurate would require admitting that under the theory of dialectical materialism, education needs to be a process of personal interaction with other people and the environment. That interaction, in turn, creates the desired changes, both internally within the mind and externally within the surrounding physical world, that may enable the desired broader transformations. Being honest as usual would impede any chance of experimenting with the future on a massive scale involving most of our collective existence. So instead we are told deceitfully we must defer to the ‘experts’. Who frequently know far less about what is actually meaningful than we ordinary Americans. Luckily for us, Fullan confessed that (with italics) that we “are talking about a learning society not just a learning school system. The commitment and practice of learning must find itself in all kinds of organizations and institutions if it is to achieve any kind of force in society as a whole.” (Remember two posts ago, Peter Drucker also saw organizations as key to his government-steered, planned economy and society with education as the transition vehicle). The 1992 program for the “human development project” for Canada and the United States is cited by name and is laid out in a document euphemistically called The Learning Society (because citing to Uncle Karl at that time was considered unwise and his blueprint needed name laundering) and published by CIAR–the Canadian Institute for Advanced Research. Before we cover those aims, we have another global radical (with a blog tag and a perch at Harvard Law), Roberto Mangabeira Unger, who has also laid out the global transformation vision, including the necessary role of education. He also wants to limit education to “the development of generic capacities by contrast to both training in specialized skills and the passive transmittal of information.” Those latter two traditional purposes of education were thought to impede “wholehearted engagement and action” towards the kind of democratic experimentalism Unger laid out in his 1998 book Democracy Realized: the progressive alternative. I bought that book after a mention of it because I recognized Unger’s influence (he was a professor at Harvard when both the Obamas were in law school there) and all the references we have encountered in the education reforms to democracy as the goal and progressive, polyphonic federalism (Jan 28, 2015 post) as the means to get around the US Constitution. Reading the book I can recognize how closely what Unger wants ties with the actual pushes I am seeing now at the state and local levels in the US. At one point Unger stated specifically that US states were already pursuing his vision of democratic experimentalism by transforming institutions. Unger made it crystal clear he wanted the obstructions of the US political system’s “checks and balances” that impede social transformations aimed at restructuring property and social relations to be disregarded and overriden. That is something we should all keep in mind as the federal government sends money to states and cities and governors, legislators, mayors, and city councils all pursue comparable reforms to what Unger laid out at the necessary, “decentralized”, local level. With the formal sponsors of the Common Core and several federal agencies all now pushing Competency as the goal of both K-12 and higher ed for all students, let’s keep in mind Unger’s desire for and definition of generic capacities for all. “Such capacities may be practical as well as conceptual [think of Enduring Understandings, Understanding by Design, and core disciplinary ideas in the current implementation], and they include the core substantive tools of learning. The heart of this education in capacities is the transfiguration of the actual by the imagination of the possible. In natural science and social and historical study we come to understand how and why things work by discovering the conditions under which each thing can become something else.” Adapt. Evolve. That certainly puts the C3 Social Studies Framework, Next Generation Science Standards http://blogs.edweek.org/edweek/curriculum/2015/03/teaching_the_next_generation_s.html , and the APUSH controversy over its new, divisive conceptual framework in the light of their true transformative mindset purposes, doesn’t it? I have previously pointed out that the Inclusive Prosperity vision (Feb 22, 2015 post) fits Marx’s Human Development Model perfectly and that it is alarming that in December 2013 the UK and US made achieving “subjective well-being” the new purpose of governments (Dec 23, 2013 post). The year after the dissolution of the USSR and 3 years after the Berlin Wall fell, we got a vision of wholesale social and economic, nonconsensual transformation, that stated that “reconceptualizing the nature of learning and the relationship between collective and individual development” provides the “knowledge base for moving our own society forward.” It just so happens that that reconceptualized “learning” fits with the parameters laid out by the QEM Project from the last post so that Uncle Karl’s vision can be shrouded and compelled by interpretations of federal civil rights laws. The Learning Society foresaw this convenient cover and mentioned the “overdue recognition that as a society, we need to include previously excluded groups on an equitable basis, particularly indigenous peoples and those from minority cultures.” The previous paragraph had discussed the need for a Learning Society to deal with “the problems associated with large scale immigration, with poverty, and with unemployment are increasing.” Collectivism is thus the answer for the very problems governments created in the first place with previous bad policies. Since the Learning Society has little use for what an individual wants, why do governments want prosperity and economic growth? “To ensure that they create sufficient wealth to support a broad range of social, medical, and human services.” No mention of the added bonus of funding lots of public sector pensions for the dispensers of those services. 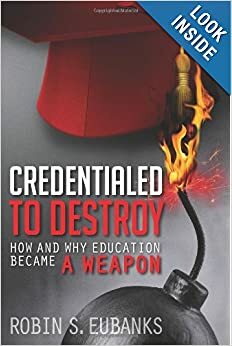 So add to the reams of source materials I lay out in my book Credentialed to Destroy: How and Why Education Became a Weapon on how the Cold War did not end quite as advertised, this Learning Society vision. Who precisely did win if the “main objectives of a CIAR program in human development” to be implemented starting in 1992 in Canada and the US is to “reconceptualize the dynamics of collective and individual human development”? If governments at all levels, and the organizations they are creating and funding, are dedicated to creating an “ability to motivate and organize all members of a society, in an innovative fashion,” did we escape from the Cold War still, factually, a free people? Especially if taxpayer-funded education and a new definition of Learning binding all of us at the level of our minds and personalities is the declared, intended vehicle. Perhaps “Not Serfs Yet” as our motto was a premature boast?